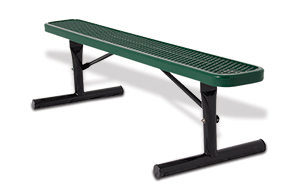 Built for resiliency and made for enjoyment, the E-Series flat park bench features a 10" diamond pattern seat plank, reinforced with a flat steel brace and supported by a heavy-duty 2-3/8"O.D. round steel tube frame. Combining an all-steel construction, open diamond seat pattern and durable, non-corrosive thermoplastic, powder-coated finish provides lasting protection against the elements. ►Need a Flat Bench Fast?